It's pretty cliche...but when giving and receiving a gift, it is the thought that counts. I have always believed that. The way a card is written or the effort put forth in finding the perfect gift is a telling sign of how someone feels about you. 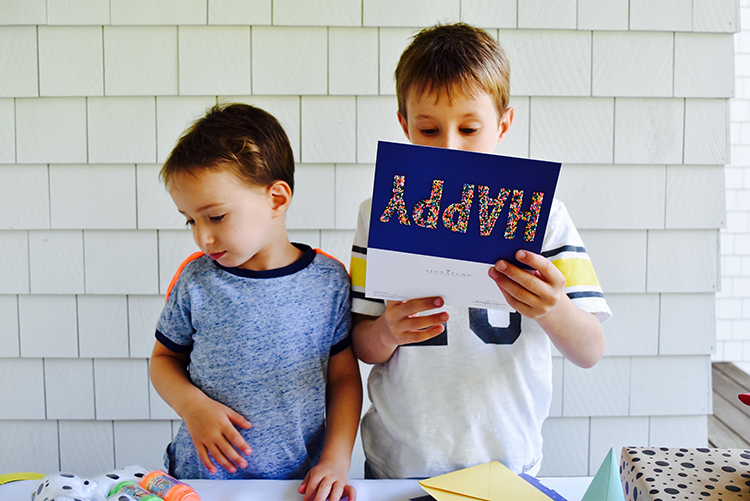 That's why, when we were asked to participate in the #HallmarkatWalgreens #CardsandCake campaign, I was very excited to use this opportunity to find the perfect cards for my son Luke for his 4th birthday! This year for Luke's birthday we had a big ol' pirate pool party. Since that was a party for a large group of our friends and family, I wanted to celebrate more intimately just with my boys for some one on one quality, birthday time together. We had dinner on the patio with an easy meal of pizza and salad and ice cream sammies for dessert. Naturally I set the table with an Everyday Soiree Party in a Box making the prep and clean up a breeze. My favorite part about putting together this small dinner party for Luke's 4th birthday was choosing the birthday cards. We had family members from Canada send Luke gifts through Amazon so to spice things up I wrapped each gift and added a card with a note that they dictated to me for Luke. I went over to our local Walgreens and found the most fantastic and I mean fantastic Hallmark Signature birthday cards that I have ever seen. One card had a felt mask that you could take off and wear, one had a photo prop mustache on a stick and one was a party in a box! Do these people at Hallmark know me or what?! I was floored. Each card was better then the next. I could not choose! There was one that stood out as a perfect card to come from Gavin and that was the card with text written in CANDY! FABULOUS! Of course Luke ripped through the gifts excited to see what he got while Gavin spent the time reading each card to his little brother. It was the sweetest thing I'd ever seen. I have always been the type to save birthday cards. I have shoeboxes upon shoeboxes of cards dating back to when I was a kid. Now I do the same for my children so they can look back on their special birthday wishes because these are the Hallmark moments worth saving. Our friends at Hallmark will be giving away our Everyday Soirée in a Box as a part of a prize pack to four lucky winners! These winners will be chosen from people who participate in the Twitter Party hosted by @hallmark on July 28th from 8-9pm around the hashtags #HallmarkAtWalgreens and #CardsAndCake. Be sure to tune in to be eligible! This post was written in partnership with Hallmark.